MainAll NewsMiddle EastAshton Criticizes Israel Over Beit El, Temple Mt. Ashton Criticizes Israel Over Beit El, Temple Mt. 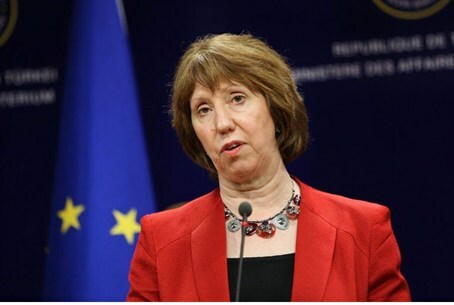 EU foreign affairs chief Catherine Ashton criticizes Israel over its plan to build in Beit El, as well as tensions on the Temple Mount. EU foreign affairs chief Catherine Ashton joined the U.S. on Friday in criticizing Israel, both over its plan to build in Beit El as well as over the tensions this week on the Temple Mount, AFP reports. "The High Representative is concerned by developments over the past week in East Jerusalem and the West Bank which have increased tensions on the ground and risk undermining current efforts to re-launch peace talks," Ashton’s office in Brussels said in a statement quoted by AFP. "It is important that those concerned exercise maximum restraint and refrain from any actions which could drive the sides to the conflict further apart," added the statement. The communiqué said Ashton was "disturbed by recent events in East Jerusalem such as those that took place at Orthodox Easter, the unrest in the area of the Haram al Sharif/Temple Mount and the temporary detention of the Mufti of Jerusalem and Palestine on Wednesday." Israeli police had questioned and released Jerusalem's most senior Muslim cleric, Mufti Mohammed Hossein, for suspected involvement in throwing chairs at a group of Jews on the Temple Mount. Ashton’s statement underlined that it was "essential that access to the holy sites in Jerusalem for peaceful worship for all denominations is fully respected." It made no mention of the fact that the Waqf, which was left in charge of the Temple Mount after it was liberated by Israel in 1967, has removed every sign of ancient Jewish presence at the Jewish holy site and has consistently destroyed Jewish antiquities on the Temple Mount in a direct violation of a ruling by the Supreme Court. AFP reported that Ashton also railed against the approval of 300 new homes in the Binyamin town of Beit El. The Civil Administration gave its preliminary approval for the construction of 296 homes in Beit El, based on an agreement that was reached with the residents of the town’s Ulpana neighborhood. The residents agreed to leave their homes non-violently last year, after the Supreme Court ordered that they be demolished, with the government promising in return to build 300 new homes in Beit El. "The EU has repeatedly declared settlements to be illegal under international law and to constitute an obstacle to peace," the statement said, according to AFP. The PLO’s chief negotiator, Saeb Erekat, slammed Thursday’s move, saying it sent a clear message to Washington that Israel was not interested in resuming the frozen direct talks. "We condemn this new decision which is proof that the Israeli government wants to sabotage and ruin the U.S. administration's efforts to revive the peace process," he said.